Summary: Use these 12 tips and printable money lessons to give your kids a head start on a solid financial future. 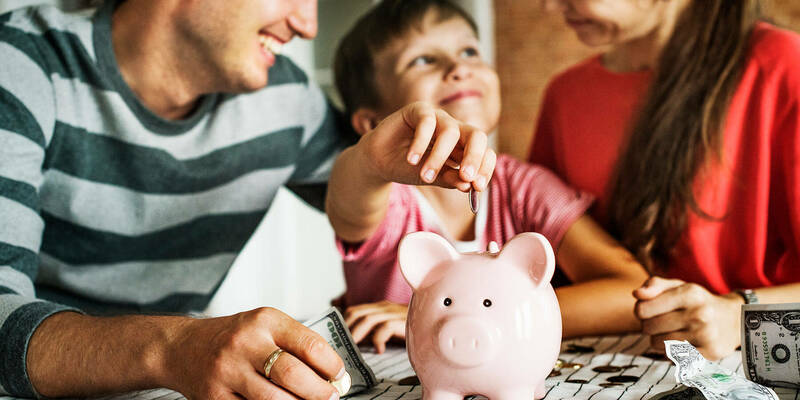 Teaching kids about money and finances can be a daunting task, but it’s a crucial parenting step to set them up for long term financial success. Learning good money habits early on can teach kids to make good choices like building credit early and avoiding unnecessary debt. Teaching kids financial literacy as early as possible is key. As soon as they can learn to count, they can understand the concept of money—and this is when it’s important to build good habits. For children ages ten and under, start with the basics: earning, spending, saving, and giving. Consider an allowance to introduce basic budgeting skills. Introduce the concept of needs versus wants and the difference between short-term and long-term goals. Once you've mastered the basics with your kid, look for ways to incorporate real world concepts like debt, interest, and investing, if only at a basic level. Simple, risk-free activities include exploring online stock simulators, or charging a little bit extra as interest if your kid asks to borrow money. Start by establishing a basic understanding of the concept of money. Introduce the different types of coins and the value each one holds, and give examples of what types of coins to use when. Make learning fun! Lessons that feel like games for young children can help them be more receptive and excited to learn. They also teach them the importance of acquiring assets rather than liabilities, and give them practice working with capital without having to use real currency, especially if you don’t use cash in your home. Set up a pretend store and have your child “buy” their toys, markers, or clothes. Practice transactions and help them count the amount of money needed. If you have to make change, count it out with them. This will not only encourage basic math skills, but also get them comfortable with common currency increments. Writing out savings goals with a timeline can reinforce the idea of short and long term objectives. It’s a way to teach organization and can even be used as a gateway into the world of budgeting. When your child achieves their goal, they will begin to feel more confident about money management. Just make sure the goals are achievable within a couple weeks to a month. The longer the goal takes to achieve, the easier your child might get bored or decide to give up. Start by aiming for a relatively inexpensive toy, rather than a new bike. Having your child create a budget will give them a realistic idea of what they can afford. This helps them understand the value of money and learn to not take things for granted. Although this process won’t be the same as making an adult budget, have them keep track of three basic things: spending, saving, and giving. Make a labeled jar for each category and have them portion out their allowance every week. Point out that if they spend too much money on candy or toys, they may not have enough to put towards savings or giving. This will come in handy when your kid wants to buy something, but needs to put in the work and planning to make it happen. 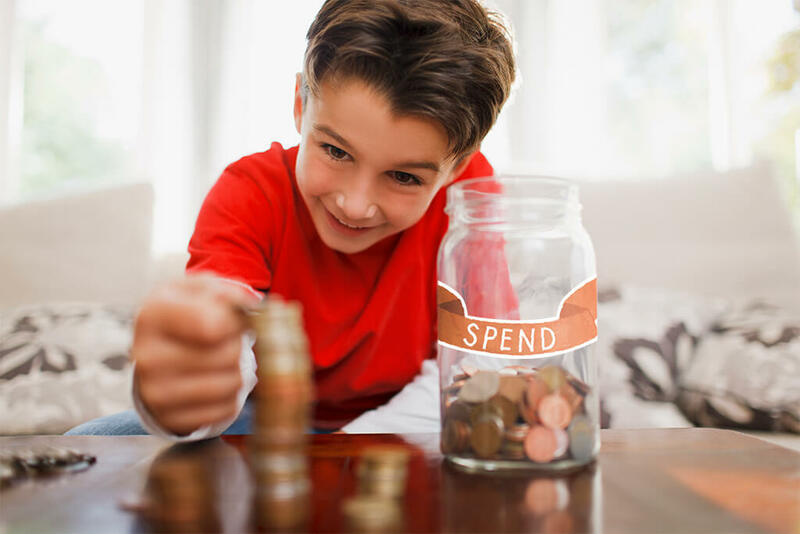 With a bit of discipline, sticking to the budget can be rewarding and help your child stay on track and achieve their savings goals. Earning is a key concept in learning about finances, so give them an opportunity to do so through completing a weekly list of chores. Completing the work and getting fairly compensated will teach them the value of money and give them a sense of accomplishment. 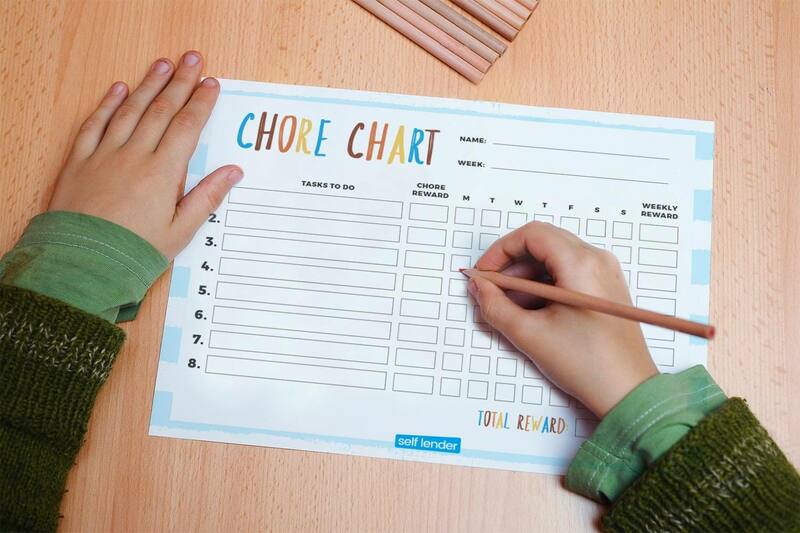 At the beginning of each week, fill out a chore chart with all of your kid’s responsibilities listed clearly. At the end of the week, assess which chores have been completed and pay them accordingly. This can help them plan ahead based on expected future income. Teach your kids early on that money should not be used to gain instant gratification. Teach them the 48-hour rule: if they want to buy something, have them wait 48 hours until the impulse cools down. If they still want it—and it’s within their budget—they may make the purchase. Saying “no” to impulse purchases is a key skill behind not spending more than you make, which will help them avoid debt in the future. Involving your kids in major and minor financial decisions teaches them the importance of doing their research before making a big purchase. Even bringing your kid along on your next shopping trip is a great way to teach them about the practical, day-to-day money decisions you make. At the grocery store, explain why you buy generic brand peanut butter or paper towels. Show them that a better brand name does not always equal better quality, and that buying generic may seem like a small difference, but the savings add up. You should also consider bringing your kid along when making major family purchases like a new car or home. Encourage them to ask questions and explain the reasoning behind your purchasing decisions. Even though you have the ultimate authority, your kid will enjoy having input, and they will likely learn something along the way so that they can be more prepared when it’s their time to make the same kinds of purchases. Credit, debt, and interest rates are tough topics, but there are ways to break these concepts down so even very young children start to learn them. Take the edge off of tough financial situations by going through them in a game like Monopoly or The Game of Life. You’ll get to explain what is happening in a non-threatening environment. Don’t be embarrassed to use your own personal experiences with debt to make the concept more tangible. Explain that not all debt is “bad,” and that they will likely need it at some point, for example, in the form of a mortgage or to help pay for college. Emphasize the importance of giving early on. As soon as your child starts getting an income or allowance, make sure they are setting aside some to give to a charitable foundation or other cause that they care about. If they are a bit older, explain that some employers have donation matching programs and that there are even tax breaks for charitable donations—and while this shouldn’t be the sole reason to give, it can be an added incentive. 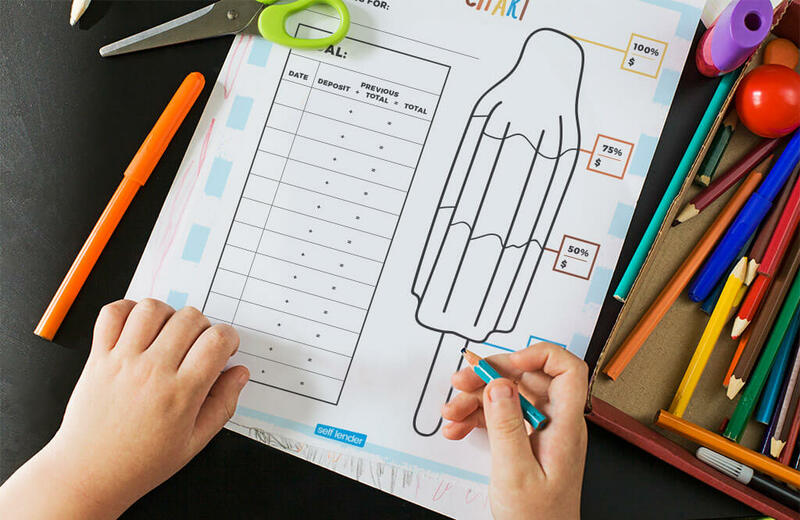 Kids just want to have fun—so get creative! 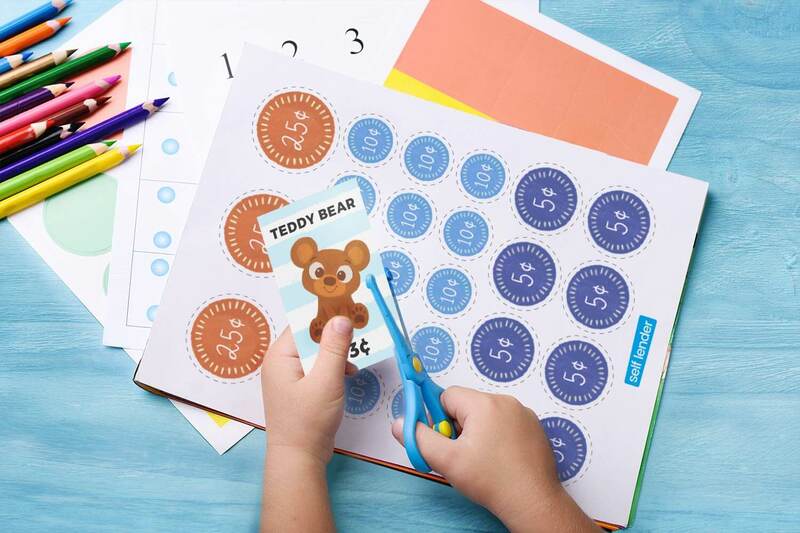 Download money apps for kids, print out a savings chart that maps out major milestones, or consider matching whatever your kid can save up as extra motivation. When they hit their savings goal, it’s time to celebrate! Throw a party, or take time to enjoy whatever it is your kid worked so hard to save up for. This positive reinforcement will encourage them to set new goals and be excited about saving. Children are likely to pick up habits and behaviors displayed by their parents, so be mindful of how you talk about money around your kids. Think about your purchasing priorities when your kids are around. Are you frugal or free-spending? Be open with your own financial goals and credit score to help your kids learn the importance of saving money. This Parents, Kids, and Money Survey found that parents who openly discussed finances with their kids were 20% more likely to have kids that say they are smart about money (when compared to parents who didn’t discuss finances) . Although talking to young children about the concept of credit, debt, and interest can seem intimidating, it’s essential to help them create strong financial habits throughout their life. Starting the conversation early will help them make better money decisions, build a good credit score, and avoid debt.